For some background, please read this post. I am also including a picture of the letters’ page from last week. There were three letters published criticising my previous letter. 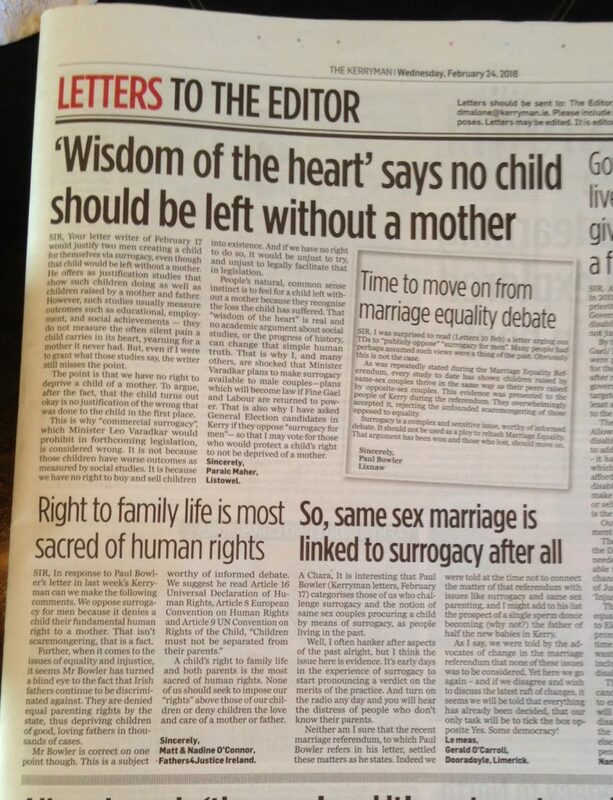 I noted, with great interest, the number of letters (The Kerryman, February 24) condemning surrogacy for gay men. Surrogacy is a complicated subject that deserves careful consideration. There are four basic stances one can take on surrogacy. First, one can oppose it in all circumstances. Second, agree with it, but only in limited circumstances e.g. when a close relative serves as the surrogate and no money involved. Thirdly, one may see commercial surrogacy, tightly regulated, as perfectly justifiable. Finally there are those who view surrogacy as a private enterprise that does not require State intervention. All very simple and straightforward. Except it isn’t. To those four positions we must add the issue of gametes. Specifically, whose gametes? Do you support surrogacy if the commissioning parent(s) has no genetic link to the child or does that matter? On top of that we have the issue of genetic history for medical reasons. Does a child have a right to know their genetic progenitors, and if so, when? Does someone who acts as a surrogate or who donates their gametes have a right to anonymity? Do they have parenting rights? Then there are the issues of economic necessity and economic exploitation. There are inter and intra jurisdictional issues. Passports and birth certificates might become problematic. And there are biological and constitutional imperatives to consider. All that and then we have to think about IVF. This is the most common method of facilitating pregnancy in surrogacy. It is expensive and stressful. Who pays for it? What happens in situations where there are multiple foetuses? And in today’s world we now need to ponder genetic manipulation. Surrogacy is a wondrous gift, but a gift fraught with practical concerns. Dealing with it requires an engagement on an intellectual, scientific, philosophical and moral level. It requires the full weight of our informed attention. It is an issue of supreme complexity and emotion. But there is a way out. There is a way to avoid contention and compromise. We can simply say, gay men can’t do it.